Ma.Re is an extensible table. 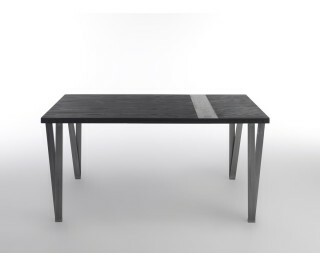 The almost invisible runners and the contrast of tactile sensations between the materials (wood and ceramic) make this table more fascinating when open, rather than closed. This is a unique gift for an extensible table. The legs open irregularly, like moorings. The ceramic extension transforms the table into a working surface which is exceptionally anti-scratch and resistant to staining. Extendable table with top in wood particleboard, veneered and finished in oil-based stain. Extends with a panel of wood particleboard with a scratch and stain resistant ceramic surface 3mm thick. Legs in hard metal.